We have already done the impossible. Don't let it stop here. Imagine a society with no art, no literature, no statues, no paintings, no great works of any kind. Imagine the impact on the quality of life for the rest of us. Although such a society sounds far-fetched, it is only through the work of dedicated individuals and the contributions of many others that artistic achievement is nurtured and developed. Without such dedication and contribution, the cultureless society becomes a reality. VM Productions is dedicated to the art of independent filmmaking. We are developing and producing quality films based on original stories and masterpieces of the world's literature. We admire the great artists of all times. The complexity of their existence and the discoveries they made help humanity move forward toward a deeper understanding of life, death, coexistence, and peace; they serve as a key source of our inspiration. 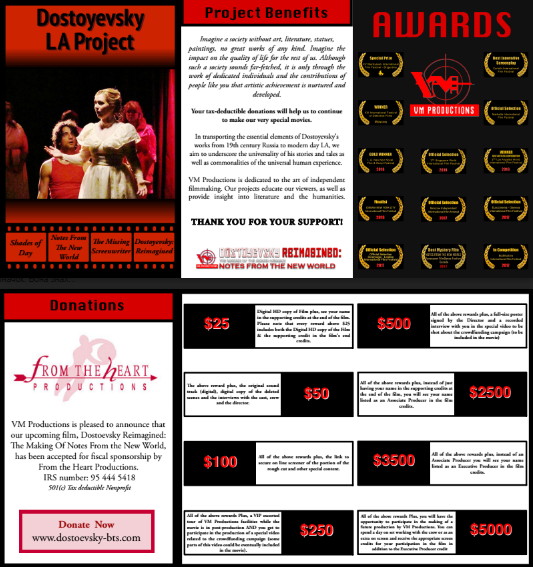 VM Productions is producing under the auspices of our fiscal sponsor From The Heart Productions, a twenty one year old non-profit organization dedicated to the advancement of writers and filmmakers. Your tax-deductible donations will help us to continue to make our very special movies. Our current Dostoyevsky-LA Project is dedicated to cinematic adaptations of four masterpieces by Fyodor Dostoyevsky, a writer whose penetration into the deepest recesses of the human heart had a profound influence on 20th century culture. In transporting the essential elements of Dostoyevsky's works from 19th century Russia to modern-day Los Angeles, we aim to underscore the universality of the great writer's tales as well as commonalities of the human experience, its values and issues. The first two films of this Project - the award winning features Shades of Day and Notes From The New World, are already completed. Shades of Day (selected for the course of cinema by the Rutgers University professor Gerald Pirog along with select films by Bernardo Bertolucci, Akira Kurosawa, Robert Bresson, Martin Scorsese, Paul Shrader, and Josef Von Sternberg) represents a contemporary envisioning of the short novel White Nights, one of the greatest love stories ever written. Notes From The New World is based on one of the most profound and prophetic works of world literature. The two accompanying films in the tetralogy Crime and Punishment, LA and Idiot, LA (the script received the grant from Warner Bros Fund) are currently in development. Once completed, the Project and accompanying educational materials will constitute a bona fide cultural event and catalyst for artistic truth by presenting a classic author to an entirely new generation in a fresh and exciting form. and many other companies and individuals who have made contributions for the creation of the completed project and promised their support for our next projects. Please join them by making your own contribution today. Even a small donation makes a huge difference. We have come very far on so little. We need your help to continue to reach our goals. Please don't let it stop here. Your support not only brings us closer to completing our quality movies, but it entitles you to an acknowledgement on screen in the film (unless you would prefer to remain anonymous). Digital HD copy of Film Plus, see your name in the supporting credits at the end of the film. Please note that every reward above $25 includes both the Digital HD copy of the Film & the supporting credit in the film's end credits. The above reward Plus, the original sound track (digital), digital copy of the deleted scenes and the interviews with the cast, crew and the director. All of the above rewards Plus, the link to secure on line screener of the portion of the rough cut and other special content. All of the above rewards Plus, a VIP escorted tour of VM Productions facilities while the movie is in post-production AND you get to participate in the production of a special video related to the crowdfunding campaign (some parts of this video could be eventually included in the movie). All of the above rewards Plus, a full-size poster signed by the Director and a recorded interview with you in the special video to be shot about the crowdfunding campaign (to be included in the movie). All of the above rewards Plus, instead of just having your name in the supporting credits at the end of the film, you will see your name listed as an Associate Producer in the film credits. All of the above rewards Plus, instead of an Associate Producer you will see your name listed as an Executive Producer in the film credits. All of the above rewards Plus, you will have the opportunity to participate in the making of a future production by VM Productions. You can spend a day on set working with the crew or as an extra on screen and receive the appropriate screen credits for your participation in the film in addition to the Executive Producer credit. Please take a few moments to support the arts by making a contribution today. All donors will receive a letter of acknowledgement. Any kind of service from any reputable company will be greatly appreciated. We are currently looking for Crowdfunding Assistants/Collaborators, Newsletter Writers, Web Designers, Graphic Designers/Illustrators, Legal Advisors and Marketing Consultants. A deferred pay, credits and participation in our productions will be gladly considered. For more info about our Opportunities please contact us. Thank you very much for supporting these very special projects! Copyright © 2014-2017 VM Productions. All rights reserved. Designed by VM Productions.